If marketing is a game, then ePromos is here to prep you for game day with promotional stadium cups! Custom stadium cups are the perfect marketing tool for any outdoor occasion; whether reaching audiences in a sports arena, at a concert, exhibiting at a trade show, attending an outdoor festival or company picnic, logo stadium cups will help you build your brand and connect with customers. When you put your logo on these reusable cups, you'll reach wide audiences for minimal cost, making them the perfect marketing tool for your business. And when you pass them out at events, recipients will love to take them home and reuse them over and over again, giving you long-term, repeated exposure. So start browsing to help audiences everywhere quench their thirst in style -- we have a variety of customization options including color, size, materials and patterns. No matter your needs, you're guaranteed to find promotional stadium cups that will help build your brand. Solo Cup Style Party Cup Custom Tumbler - 20 oz. Get the party started and your brand recognized with this Solo cup style party cup custom tumbler. Wave Textured Custom Stadium Cup - 16 oz. Your next sporting event or party won't be complete without these Wave Textured Custom Stadium Cups! They are BPA free and made in the USA. Custom Stadium Cups - 12 oz. Sturdier than paper yet disposable; the 12 oz. Custom Stadium Cups are a great way to serve everything from ice cream to beverages. Solo Cup Style Double Wall Custom Tumbler - 16 oz. Textured Custom Stadium Cup - 16 oz. This unique Textured Custom Stadium Cup makes the perfect giveaway for your next office party or tailgating event! It is BPA free and made in the USA. Jewel Custom Stadium Cup - 32 oz. Score big promotional points with these big, bright custom stadium cups. Tall Custom Stadium Cup - 24 oz. Sturdier than paper yet disposable; the 24 oz. custom stadium cup is a great way to serve everything from snacks to beverages. Full Color Plastic Custom Stadium Cup - 16 oz. Market your upcoming event, open house or team with this 16 oz. Plastic Custom Stadium Cup. Your custom imprint is wrapped, in full color, on this durable cup that will bring a lot of brand exposure! Solo Cup Style Single Wall Custom Shot Glass - 2 oz. Serve up shots or other fun concoctions at your celebration or event in these mini solo cup style single-wall custom shot glass. Heavy Duty Custom Tumblers - 22 oz. Just like our 32 oz. heavy duty custom tumbler but smaller, these custom tumblers are made of heavy duty plastic to endure use, giving you long-lasting brand exposure. Full Color Plastic Custom Stadium Cup - 22 oz. Promote your team or upcoming event with this 22 oz. Plastic Custom Stadium Cup. Your custom imprint is wrapped, in full color, on this durable cup that will bring a lot of brand exposure! Vibrant Promotional Stadium Cup - 16 oz. Every time you use this promotional stadium cup your logo, school, or marketing message will get exposure! Frosted Flexible Printed Stadium Cups - 16 oz. Enjoy your favorite beverages and promote your company at your next event with these classic printed stadium cups in frosted colors. Full Color Plastic Custom Stadium Cup - 32 oz. Order the 32 oz. 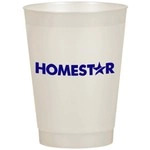 Plastic Custom Stadium Cup for your boosters club, outdoor event or any fundraiser! Your custom imprint is wrapped, in full color, on this durable cup that will bring a lot of brand exposure! Frosted Flexible Printed Stadium Cups - 10 oz. Enjoy beverages and promote your buisness with these frosted customized tumblers featuring your imprinted logo. Get ready for game day with this double wall custom tumbler inspired by the Solo cup, a tailgating party favorite. Solo Cup Style Promotional Tumbler - 16 oz. Made of double wall plastic, this red solo style promotional tumbler will keep your drink colder longer. Promotional Stadium Cup - 22 oz. This promotional stadium cup is great for sporting events, corporate picnics and fundraiser walks. Fluted Jewel Custom Stadium Cup - 24 oz. Great for outdoor events and parties, these bright, custom stadium cups are 24 oz. and make a great souvenir for all kinds of occasions. Tall Custom Stadium Cups - 32 oz. A wide variety of colors are available on these custom stadium cups. Order today. Mood Confetti Custom Stadium Cup - 17 oz. Confetti custom stadium cup changes color when filled with ice cold liquids. Fluted Custom Stadium Cups - 24 oz. At home or on the road, these generously sized custom stadium cups will score fans for your team. Mood Color Changing Custom Stadium Cup - 12 oz. A custom stadium cup that changes color with ice cold liquids you will want at your next event. Color Changing Custom Stadium Cup - 17 oz. Custom stadium cup changes color in the sunlight. Full Color Mood Color Changing Custom Stadium Cup - 17 oz. A custom stadium cup that features a full color imprint and changes color with ice cold liquids you will want at your next event. Full Color Plastic Custom Cup - 12 oz. A visually stunning full color imprint, imprinted plastic cups. This unique 16 oz. Solo Cup Style Double Wall Custom Tumbler offers interior volume indicators that shows specific ounce levels. Perfect for outdoor celebrations! Silipint Silicone Custom Tumbler - 16 oz. Thick and sturdy, yet squeezable! The 16 oz. Silipint Silicone Custom Tumbler is the perfect companion for indoor & outdoor dining, camping, and tailgating because it will not melt if placed near ovens or grills. Full Color Custom Plastic Cup - 20 oz. A visually stunning full color wrap, reusable icustom plastic cup. Glow-in-the-Dark Custom Stadium Cup - 16 oz. Your message will light up the room when it's on these cool custom stadium cups. ePromos is here to coach you to victory with practical, affordable and effective promotional products like our custom stadium cups. These unique, reusable cups prominently display your logo to the world -- and they're affordable on any budget. Custom plastic beer cups are inexpensive, yet effective in marketing your brand because you can give them out to anybody for any outdoor occasion. Whether you're promoting a local sports team, your company picnic, an outdoor festival or any other event, our custom printed stadium cups are one of the essential accessories you'll need. These plastic beer cups make fun collector's items so your recipients will remember you every time they reuse them. Get the party started with a classic solo-style cup with your logo or message emblazoned on the front. Give your company a shot at becoming a household brand with customizable shot glasses. Enhance your tailgate or BBQ and stay in it for the long haul with our 22 oz. heavy duty custom tumblers. Add a little extra flair to your marketing campaign by giving out cups that glow in the dark! They're perfect for people of any age. All of our reusable logo stadium cups are available in a variety of styles, colors, sizes and imprint options, so start browsing to find what your audience will love. Sporting events are always more fun with a nice drink in hand, so you might as well help recipients enjoy sporting events with the best cups in the world! ePromos' staff of graphics and branding experts will help you through every step of the customization process. Enjoy any sporting event in style while bringing new eyes on your brand.